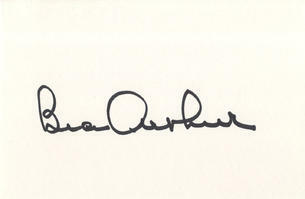 This is a hand signed 6" x 4" white card by the late American actress. Beatrice "Bea" Arthur (born Bernice Frankel, May 13, 1922 – April 25, 2009) was an American actress, comedian, and singer whose career spanned seven decades. Arthur achieved fame as the character Maude Findlay on the 1970s sitcoms All in the Family (1971–72) and Maude (1972–78), and as Dorothy Zbornak on the 1980s sitcom The Golden Girls (1985–92), winning Emmy Awards for both roles. A stage actress both before and after her television success, she won the Tony Award for Best Featured Actress in a Musical for her performance as Vera Charles in the original cast of Mame (1966).